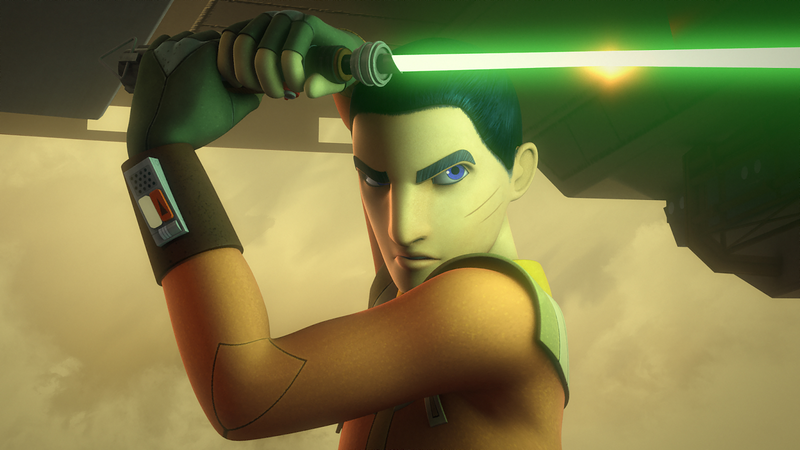 Star Wars Rebels returned with a bang last night, as "Steps into Shadow" kicked off the third season of the animated series. While it didn't have the WOW! factor of previous premieres, "Steps into Shadow" was a solid start to the season, introducing us to exciting new characters and shaking up our expectations for the ones we've come to know and love. The main theme running through this episode is that of consequences. We really see the effects of the events of last season's finale on Kanan and Ezra. Kanan has gone into an exile of sorts, secluding himself from the rest of the crew. This in turn has a significant impact on Ezra, who blames himself for Kanan's blindness and Ahsoka's "death," leading him to turn to the Sith holocron he recovered from Malachor. But the teachings of the Sith holocron have been taking Ezra down a dark path, and have pushed him to a place where he thinks he doesn't he needs Kanan, even telling him as much. In this episode, Ezra is far more aggressive than we've seen him in the past--not only using the Force to mind trick an AT-DP driver to turn on his stormtroopers, but also angrily shouting reckless orders at his mates. There seems to be a new-found tension among the crew of The Ghost since the events of last season's finale. Ezra's aggression does not go unnoticed, especially by Sabine, who seems to be the most weary of this "new" Ezra. In an interesting twist, Ezra claims to be using the teachings of the holocron for good, not evil. He asserts it is so that he will never let his friends get hurt again. However, the holocron inspires behaviour of a the sort we've only really seen from Ezra once before: when he met Maul in "Twilight of the Apprentice". In a way, by blinding Kanan, Maul almost succeeded in turning Ezra to the Dark Side. Though this made Ezra turn away from Maul in the moment, it led to him pick up the Sith holocron and start training with it. And, as so often occurs when characters meddle with the dark side for "good" reasons, he almost wound up losing his friends again--which would have likely pushed him even further down the dark path. However, we are left to wonder if, now that Ezra has a taste for the power of the dark side, he might seek it out again in the future. Where the events on Malachor sent Ezra down a dark path of action, they led Kanan down a path of self-loathing and pity. Kanan’s failure on Malachor has left him physically and emotionally scarred. As he says later in the episode, he sees only anger, loathing, and grief when he looks inward at himself. This creates a mental barrier, causing Kanan to fear that he would cause more damage to those around him should he rejoin the fight. It takes some forced-Force introspection by the Bendu to get him to snap out of it and go to Ezra’s rescue. The Bendu is one of the stand out characters in this episode. The massive Force-wielder, voiced by Tom Baker of classic Doctor Who fame, is another example of someone who uses the Force in a way that is different from the Jedi and the Sith. Bendu calls himself "the one in the middle", neither light nor dark. While his teachings seem like something that could have come from Yoda, his ease around the Sith holocron establishes that he is not beholden to one side or the other. The theme of consequences is not restricted to the heroes in this episode. The much celebrated appearance of Grand Admiral Thrawn, a character first seen in the 1991 novel Heir to the Empire by Timothy Zahn (now part of the "Legends" universe), is very much a result of the Empire's lack of success over the past two seasons. While characters like Agent Kallus and the various Inquisitors were effective threats early in Season One, as the series has progressed we have seen them suffer defeat at the hands of the Rebels too many times to pose any meaningful danger to our heroes. It's good to see that this has not gone unnoticed by their superiors, with Grand Moff Tarkin and Governor Pryce (also making her first appearance on the series this week) calling in Thrawn as a result. Thrawn himself did not disappoint. While we didn’t get to see too much of him in this premiere, he still managed to steal every scene he was in. The voice work by Lars Mikkelsen (Sherlock, House of Cards) was stellar. Mikkelsen managed to make Thrawn at the same time both soft-spoken and dominating. The show also did an excellent job of juxtaposing Thrawn with other Imperial officers we've come to know over the course of the series, particularly Admiral Konstantine and Agent Kallus. We see that Thrawn's method's are confusing to them, in that they don't see the big picture Thrawn is working on. Beyond the responses of various characters to the events of last season, the events of this episode had their own set of consequences, some positive as we discussed above with Kanan, others negative. While all our heroes (barely) made it out alive, Ezra's actions in this episode still had a cost. Not only did we lose The Phantom in this episode, but Ezra was also stripped of his command. It will be interesting to see whether and how the loss of The Phantom affects the crew of The Ghost going forward, seeing as it has been a part of the series since the beginning. It was also interesting to hear all the talk of the bigger picture in the episode. At the end of the episode we learn that the Y-Wings are being delivered to General Dodonna's Rebel cell, and earlier in the episode Commander Sato speaks of plans for an upcoming mission to strike the Imperial facilities on Lothal. On the Imperial side, we learn that Thrawn's mission is larger than just the capture of one Rebel cell. We know the Empire is aware of the Rebel Alliance by the time of A New Hope, so perhaps we'll start to see more interaction between the Rebel Cells and begin to learn how the Empire came to know that there was more to the cells than meets the eye. A couple of other quick things worth mentioning--first, Hondo was a delight as usual. The pirate was up to his usual schemes in this episode, helping the rebels when it benefited him and leaving them behind when things got a little too intense. And, in another example of the theme of consequences, it was intriguing to see Admiral Titus again and see how his failure last Season (allowing a new Imperial weapon to be destroyed) led to a significant demotion. Overall, "Steps Into Shadow" is a strong start to Season Three, delving into the consequences of last season for both our heroes and the villains. Even though it doesn't reach the heights of previous season-openers "Spark of Rebellion" and "Siege of Lothal", this year’s premiere is nevertheless an exciting ride filled with intensity, humor and emotion, and lays a solid foundation for the rest of the season. Check out my reviews of Star Wars Rebels Season Two here. Excellent review Dominic. Here are my thoughts , Wow great Season 3 premier of Star Wars Rebels. Steps Into Shadow parts 1 and 2 was so good , amazing , action packed , intense and emotional. So many feels in this one. The look of Grand Admiral Thrawn the creators of the show nailed it very faithful while different to The Thrawn we hear about in The Star Wars Legends Books. Plus the animation and designs where just amazing. Also the musical score by Kevin Kiner great as always. That was a lot to take in. You get the sense based on the time jump that the crew of the ghost is going through a lot between Ezra with his change in attitude , Kanan trying to learn more about the force and Hera her feeling too got to feel for her. The introduction of Grand Admiral Thrawn was so great and very true to the Thrawn we see in The Star Wars Legends / Expanded Universe stories while also being different from those books etc. Having Grand Admiral Thrawn in Star Wars Canon aka Story Group Canon is so cool. Now their’s a lot of set up here in this episode that will pay off as Season 3 goes along. Also The Bendu he was very interesting and so awesome to see in Rebels plus Tom Baker (The 4th Doctor in The Doctor Who Classic Series) does such a great job with portraying him and his voice. All the voice actors / actresses did a great job in this Season 3 premier Vanessa Marshall , Freddie Prince Jr. , Taylor Gray and Tiya Sircar plus Tom Baker in his guest role too they where so good as always. Now how does this premier compare to past Star Wars Rebels Premiers? I would say it’s still just as good as those and so good. Overall I give Star Wars Rebels Season 3 Episode 1 Steps Into Shadow parts 1 and 2 a 9/10 a great episode and Can’t wait for next weeks episode titled The Holocrons of Fate. just watched the episode, kinda boring. animations still sux , i didnt like thrawn i imagine him different but its ok he can improve. what i liked is that ezra is a little less annoying and darker. Ezra may be the single worst Star Wars character ever. The show has too much dialogue. I know it's ackids show but man first it treat kids like they are idiots. Can't believe I'm saying it but there is too much Star Wars out there. It's all watered down. This in my mind was the perfect start to the season because they did not over play their hands. They kept Maul under wraps which I think was very smart because they show is about the Rebellion and their struggle with the Empire. I think showing Thrawn a few times, and showcasing his military genius when they did, was very smart because it just showed how powerful, and important he would be going forward. If you watched Rebels Recon they said they had been looking for a moment to bring in Thrawn since season 1, but they now believed this was the perfect time, and I agree. The rebellion is growing in power, and Thrawn shows how powerful the Empire still is and how they have a deadly answer to this growth by the Rebellion. Don't even get me started on Ezra, he is going to be deeply immersed in darkness by the middle of the season.